Energy Minister Albayrak delivers a speech at the 9th Energy Efficiency Forum, Istanbul, March 29. Turkey's National Energy Efficiency Action plan will save the country some $30.2 billion by 2033, Energy and Natural Resources Minister Berat Albayrak said Thursday. The minister said the plan's key focus will be on transforming street lighting and will be realized with Turkey's Renewable Energy Resource Areas (YEKA) model. Speaking at the 9th Energy Efficiency Forum yesterday, Albayrak said: "Turkey currently has around 7.5 million street lights. We have targeted to transform around 30 percent of them by 2023. This can result in annual savings of over TL 180 million ($45.38 million). This figure would go up to TL 600 million by 2033." Detailing the targets set in the plan and how they will be achieved, he said energy efficiency is an important building block of Turkey's National Energy and Mine Policy and that they were launching a new process to that end. The energy minister noted that Turkey is not a country rich in energy resources thus needs a strategic vision to stand out among the developing countries. "Energy efficiency is very important in this regard," he said. "Turkey needs to cover serious grounds in order to consume less energy and achieve higher efficiency in value-added products." "The increase in energy consumption does not make any sense on its own. You need to increase the energy intensity as well to move up in the premier league," he continued. "When we look at the world, the European Union and the developed countries, we can see that we have to carry the energy intensity to a serious level." Albayrak recalled that the National Energy and Mine Policy, which was announced to build a more prosperous society, features three main pillars, namely supply security, localization and foreseeable markets. He said both sustainable development as well as competitive and green growth should be put forward at this point. "There will be investments of around $10.9 billion by 2023. It is very important for us to use our resources as efficiently as possible and find a more competitive private sector so we can find a win-win situation." Albayrak explained that the targets they have in the action plan could save energy produced by an equivalent of 23 million tons of oil and up to 14.6 percent saving on primary energy consumption as well as 66.6 million tons in carbon emissions reduction. key a total of $30.2 billion by 2033." The minister also pointed out how housing and industry would play an important role in achieving the targets and underlined that each and every segment will play a part in this. "Today we will announce and monitor these areas in concrete terms. By 2023, 1.7 million homes will be made energy efficient, saving $1 billion. The savings will reach up to $10 billion if we consider the 20-year lifespan of thermal insulation materials," he said, adding that thermal insulation amortizes within five years. "In the remaining 15 years, that investment will enrich the citizen's pocket," he said. "Thermal insulation can save up to 40 percent on heating bills. Here, with our financial institutions, we will put out a more competitive program rather than a consumer credit-specific method," he continued. "We will create a low-interest model that can pay installments with the income from the invoice savings." 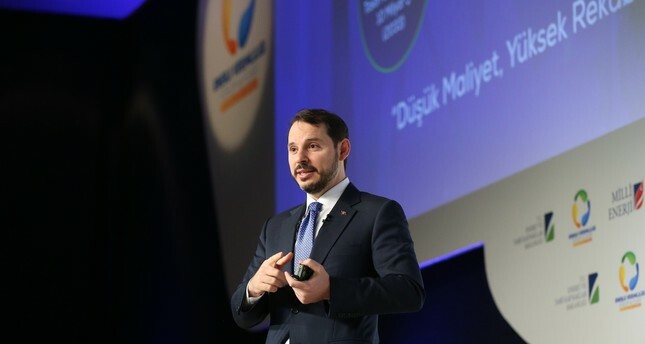 Albayrak said that the targets within the action plan were set with the idea of "low cost and highly competitive power," and that the savings will reach $10 billion in the industrial sector, which has the biggest share in energy consumption with 32 percent after housing. The energy minister also noted that the industrial sector will be provided with a support amounting up to TL 10 billion by the Credit Guarantee Fund. He said that the return period of the productivity investments made by the industrialists is calculated as three to four years. Minister Albayrak said that significant productivity work will be done in different areas, including agriculture, transportation, and insulation of public buildings. He added that the government will also launch a process for lighting streets that can transform energy efficiency. He said there are currently 7.5 million street lights in Turkey and the government is planning to replace 30 percent of them with energy efficient options by 2023. This will save more than TL 180 million and the figure will go up to TL 600 million between 2023 and 2033. "How do we do this? That is a critical question. There is a serious market, a serious margin, and a serious demand for market transformation. We will put forth the economics of this business based on the demands of the distribution companies, the regulatory authorities, the public and the citizens," Albayrak said. "We will present the economic market that will be formed under YEKA, which has been very successful in terms of locality, purchase guarantee, eliminating risks, providing domestic employment and developing alternative subsidiary industries, Albayrak said they will also present a similar model for street lighting, based on a win-win model.